Location: Home › Music Articles › Adam Young: The Owl City synth pop man launches conceptual "film scores"
Adam Young: The Owl City synth pop man launches conceptual "film scores"
The Apollo 11 space adventure kicks off new ADAM YOUNG free download initiative. Tony Cummings reports. Having seen his 'Mobile Orchestra' album make number seven in America's top album sales chart electropop man Adam Young (aka Owl City) is clearly not resting on his laurels. Starting today is an imaginative initiative for the have-laptop will-travel muso. 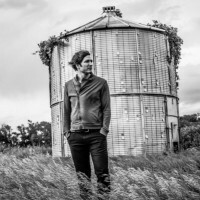 Adam Young Scores is Young's interpretation of stories that have meaning to him. They will be available for free download at www.ayoungscores.com and the usual online music retailers. Each score will be accompanied by a visual companion, created from scratch by a visual artist of Adam's choosing. The visual piece will also be released in the form of a limited edition movie poster, signed and numbered by Adam and the artist. Adam started off the announcement by reminiscing about when he first discovered a passion for music at the age of 16. "The revelation of a person's first love of music is different for everyone, but for me, it was film scores - original music written to accompany motion pictures. These types of atmospheres and anthems spoke my language and I remember experiencing a feeling of wide-eyed wonder while listening to my favourite composers. The talent and prowess of John Williams, Harry Gregson-Williams, James Horner, Thomas Newman and Alan Silvestri exposed me to a creative canon I'd never experienced before. I felt as though I'd stumbled into a universe that was made just for me. It spoke to my heart, moved me deeply, and gave me the confidence to drop everything and say, 'That. I want to do that.'" Since his "Fireflies" multi-million seller of 2012, things have been a hectic rollercoaster for Adam Young/Owl City. "The years have flown by, and here I am today [with more] motivation and creativity than ever. As I found myself looking back on my own story, I realized the ups and downs of the mainstream music space have, at times, given rise to a degree of personal frustration and stress that affects everyone in the industry. By pausing to muse on the way things are in such a place, I find myself greatly inspired to use such trials and tribulations as the means to ignore any such 'rules' the industry embodies. I consider myself fortunate enough to see the big picture from several angles, and after stopping to study over it, I suddenly feel a deep indwelling desire to make music for the sake of creating nothing but pure, bold, trailblazing art." Young added, "And so, as I listen to the works of the composers I first fell in love with, I feel a great longing to create my own version of that same wonder and euphoria that moved me as a young impressionable musician. I want to create worlds of sound that tell stories and tales in ways that cannot be described with words. I want to explore a vast, wild universe of storytelling and create in others the same fascination and curiosity I felt." The first score available today is 'Apollo 11'. Wrote Adam, "If there is a historical event I wish I could've witnessed more than any other, it may well be the events that took place during July 16-24, 1969. Men went to the moon, returned to Earth, and history changed forever. For as long as I can remember, I've marvelled at the story of the Apollo 11 mission, and the older I get, the more inspired I feel. In the history of mankind, perhaps no other technological leap forward symbolizes the same imagination, humanity and wonder quite like the Apollo 11 mission does, and it is these types of emotions I want to capture with music according to the way I feel them. This is my interpretation of what happened in July of 1969." Have listened to and THOROUGHLY enjoyed Apollo 11! My daughters and myself were impressed by the tone, rhythm are excellent! A must listen to soundtrack! I would highly recommend this album. Adam is really developing and honing his musical taste and reach, and each song is a different step along the journey of the Apollo 11. Favourite would have to be "Return to Earth" due to the post rock elements I hear.